808 State DJs = DJ sets by Andy and/or Darren (a.k.a. Spinmasters). Also see Biting Tongues & Toolshed / Homelife & Sisters Of Transistors (S.O.T.) & Massonix (all Graham Massey). 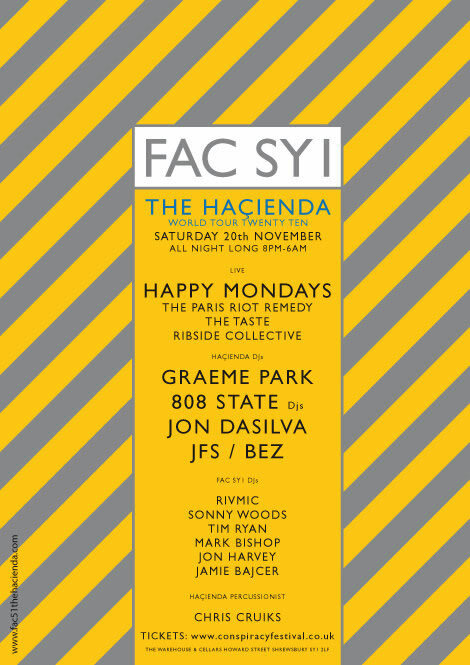 Tue:28:Dec:10 - 808 State DJs @ Hacienda Christmas Party, Sankeys - Manchester (with Graeme Park, Allister Whitehead, K-Klass DJ). Sat:20:Nov:10 - 808 State DJs @ Conspiracy Festival, FAC SYI, Severn Warehouse - Shrewsbury. 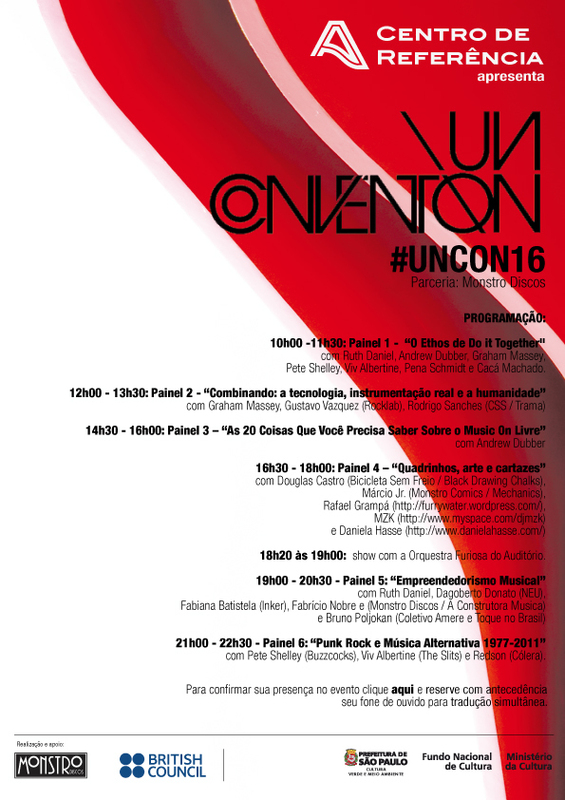 Wed:24:Nov:10 - Graham Massey - Un-Convention - Sao Paulo - Brazil. Wed:17:Nov:10 - Graham Massey - Un-Convention - Goiânia - Brazil. 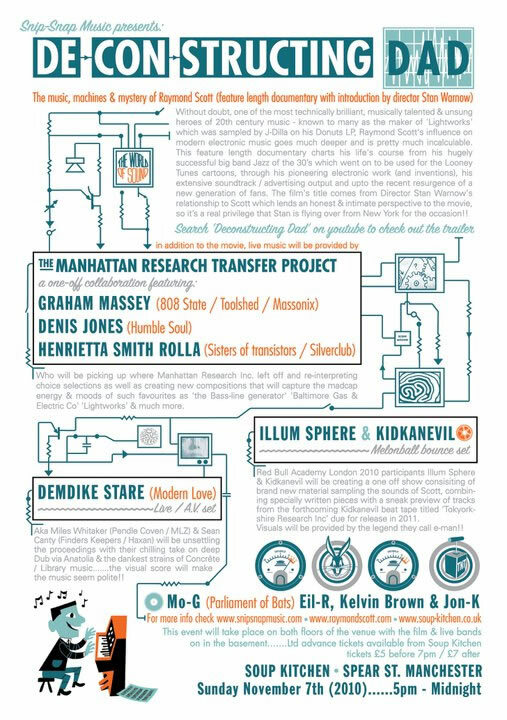 Sun:07:Nov:10 - Graham Massey / Denis Jones / Henrietta Smith Rolla as The Manhatten Research Project @ De-Con-Structing Dad, Soup Kitchen - Manchester. Fri:05:Nov:10 - 808 State DJs @ Ultradog, Manchester Ritz - Manchester. Sat:30:Oct:10 - 808 State DJs @ Monkey Hornby's - Blackburn (Nightclub closed according to website). 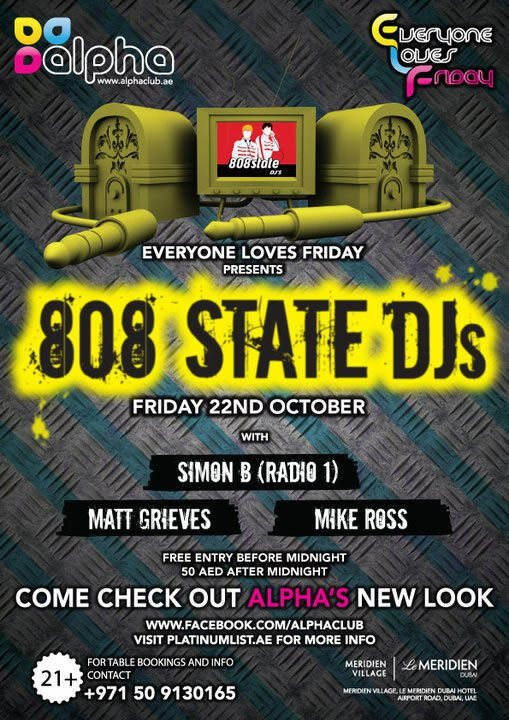 Fri:22:Oct:10 - 808 State DJs @ Alpha Club - Dubai. Sun:03:Oct:10 - Graham Massey @ Unconvention 2010, Sacred Trinity Church - Salford. Sat:11:Sep:10 - Sisters Of Transistors live @ Bestival - Isle of Wight. Sun:05:Sep:10 - 808 State Live @ Electric Picnic - Stradbally - Ireland. Line-up. 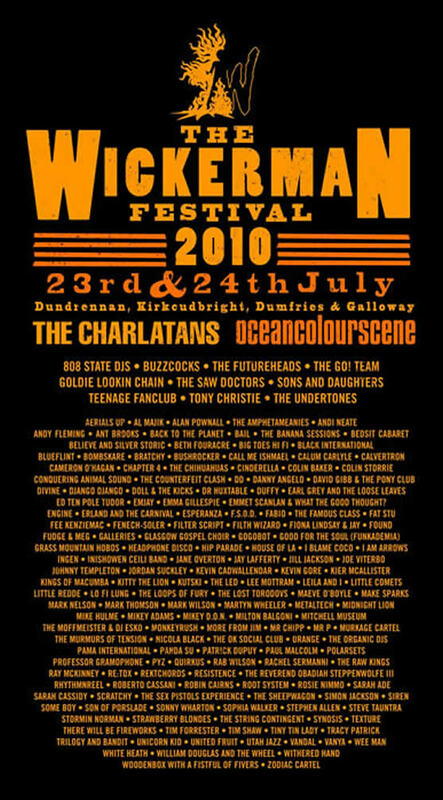 Sat:24:Jul:10 - 808 State DJs @ Wickerman Festival - East Kirkcarswell - Scotland. Sat:03:Jul:10 - 808 State DJs @ Odder Bar - Manchester. cancelled! Sat:26:Jun:10 - 808 State DJs @ Glastonbury Festival - Glade Lounge. Sat:19:Jun:10 - 808 State Live @ Mass, Brixton - London. Sat:12:Jun:10 - 808 State DJs @ The Hub - York. Sun:30:May:10 - DJ Graham Massey @ Eurocultured Festival - Manchester. Sat:08:May:10 - Sisters Of Transistors live @ FAC251 - Manchester. Alternative flyer. Sat:01:May:10 - Sisters Of Transistors live @ Start The Bus - Bristol. 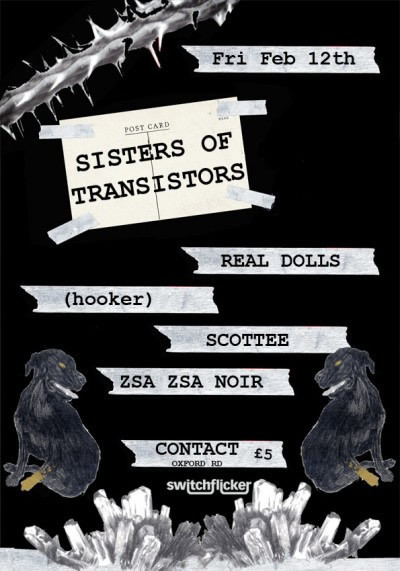 Sat:24:Apr:10 - Sisters Of Transistors live @ Ether - London. cancelled! 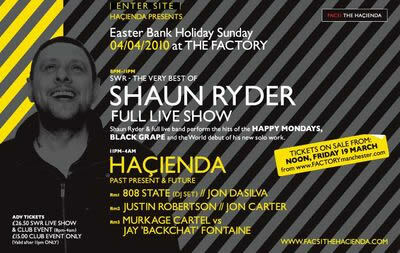 Sun:04:Apr:10 - 808 State DJs @ FAC251 - Manchester - with Shaun Ryder (Live), Jon DaSilva, Justin Robertson, Jon Carter. Sun:28:Feb:10 - Graham Massey @ Noiselab (Workshop) - Manchester. 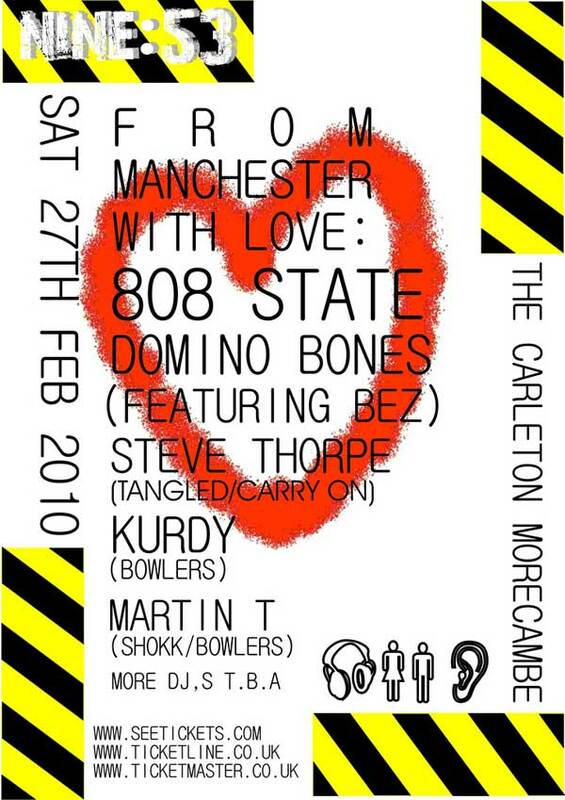 Sat:27:Feb:10 - 808 State DJs @ From Manchester With Love - The Carleton - Morecambe. Thu:25:Feb:10 - DJ Graham Massey - Urbis closing party - Urbis - Manchester. Fri:12:Feb:10 - Sisters Of Transistors live - Contact Theatre - Manchester. Sat:06:Feb:10 - Sisters Of Transistors live - Hoxton Hall - London. Sat:30:Jan:10 - 808 State DJs - Minus One - Gent - Belgium. Sun:24:Jan:10 - DJ Graham Massey - Haiti charity - Electriks Bar - Chorlton - Manchester.